Austen, Jane. Pride and Prejudice. New York: Penguin Books, 2009. Print. Most of the time, people judge with their eyes before any other sense has a say. These first impressions can be very telling, but they can also be wrong as Lizzy discovers in Jane Austen’s Pride and Prejudice. From this iconic novel, a number of interesting covers have emerged that range from promiscuous and bold to simplistic or artistic. Notably, a Penguin Classics 2009 edition designed by artist Ruben Toledo. This deluxe edition is one of three classic novels that received a cover makeover. This unique cover, intended for young adults, displays the complex, various relationships in Pride and Prejudice. We know that Austen’s novels are timeless, but covers can allow renewed excitement about its contents especially with a cover as interesting as Toledo’s. 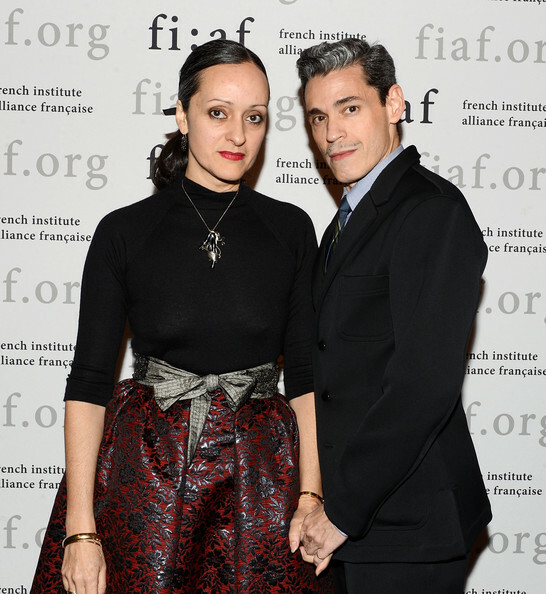 "Fashion Talks: Ruben and Isabel Toledo." Zimbio, Livingly Inc., 2013, http://www.zimbio.com/photos/RubenToledo/Fashion+Talks+Isabel+Ruben+Tol…. World-renowned fashion illustrator, Toledo, has appeared in the most highly regarded fashion and news outlets in the industry, including: Vogue, Harper’s Bazaar, The New Yorker, Visionaire, Paper, Interview, and The New York Times (Austen, 2009 edition). It is safe to say that his work is incredibly accomplished and exceptional making his covers for Penguin incredibly unique. The cover has a Tim Burton feel with lanky, silhouette figures that make up a scene across the front and back covers – including the inside flaps. The design, yet simple, gets at the complexities we see in the novel, most notably the relationship between Lizzy and Mr. Darcy. On the front cover itself, we see a man and a woman – assumingly Mr. Darcy and Lizzy – walking away from and also looking back at each other; the man is also stepping on her dress. This portrays the back-and-forth between the two characters where they both want to walk away, yet they cannot and find themselves together in the end. Lizzy, making a quick judgment of Mr. Darcy in the beginning of the novel, slowly unravels his true character – whether she immediately believes the news or not – as the story goes on. Ultimately, her opinion truly changes of him at Pemberley Woods: “The occurrences of the day were too full of interest to leave Elizabeth much attention for any of these new friends; and she could do nothing but think, and think and wonder, of Mr. Darcy’s civility, and above all, of his wishing her to be acquainted with his sister” (Austen 176). The cover really gets at this conflict that Lizzy has in her mind about Mr. Darcy, which remains the main struggle throughout the novel. 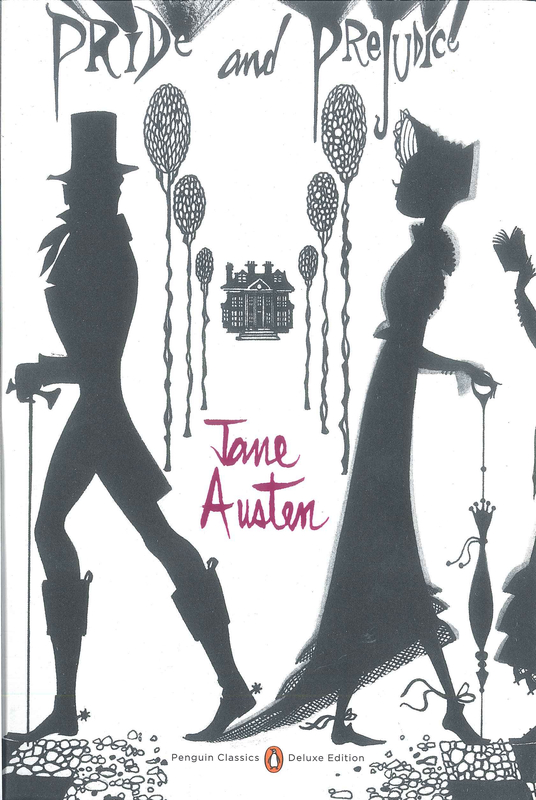 With such an elaborate depiction of the novel on the cover, Toldeo has successfully designed an accurate representation of Austen’s novel, including another love interest on the back cover flap – presumably Jane and Mr. Bingley –, two mysterious men on the back – Mr. Wickham on the back and Mr. Collins on the back flap, perhaps –, and, of course, the sisters and Mrs. Bennett on the front inside flap. Looking at the cover as a whole shows the many character interactions as well as the mystery, by which I mean that there are many points in the novel that come as a surprise. 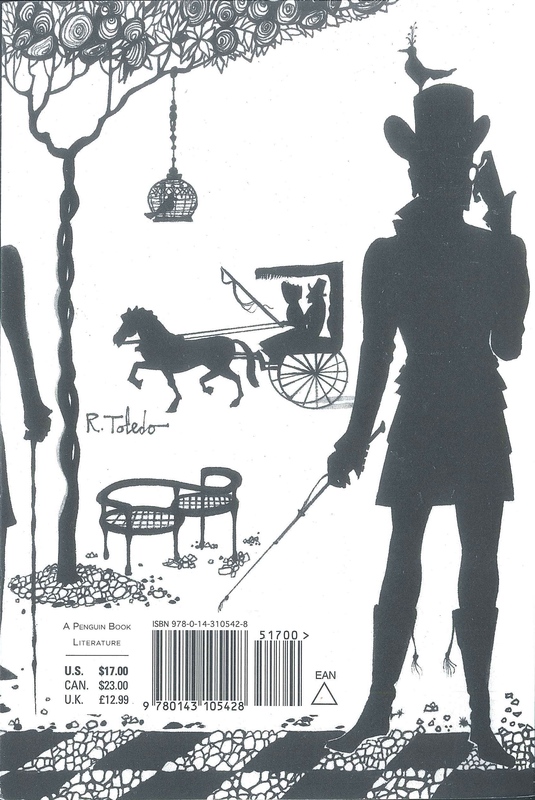 Mr. Wickham, the rake, for example, is quite a shock to readers, so Toledo shows the deceiving, mysterious nature of the characters through his use of silhouettes. Simply, we don’t really know who the characters really are. The novel can be read by many different ages, but the cover can help to attract a certain audience. In the case of the Penguin 2009 deluxe edition of Austen’s Pride and Prejudice, that audience is young adults. The cover is playful and the characters made doll-like and approachable with rounded faces, turning this classic published in 1813 to a modern, young adult novel. This shows how even a cover can change our perception of a text, for it is not even the title that we notice automatically, it is “Jane Austen” written in bright pink. Our focus, then, is immediately drawn to the author, who must be more telling and familiar than the title itself. All of these details were considered when Toledo, who had never even read the novel, designed the cover. His audience was purposeful, he reflects, “My only command from Penguin was to make art that would make youngsters want to read — to introduce these stories to a new public no matter what age” (Lipsky-Karasz). Austen, therefore, is not only a timeless text, but it can continually be remade into attracting new readers depending on how it is portrayed on the shelves. This marketing strategy allows publishers to reach a range of readers rather than select 19th century fanatics. Toledo, himself, adds more value because of his work in the fashion industry, making this not only an interesting, unique cover, but also a collector’s item. The cover, then, successfully draws people in and reveals the romance, mystery, and web of characters that the reader is sure to find within its pages. Austen, Jane. Pride and Prejudice. New York: W.W. Norton & Company, 2016. Print. Lipsky-Karasz, Elisa. “Novel Ideas: Ruben Toldeo Reimagines the Classics.” WWD. Penske Media Corporation, 2009. Web. 6 October 2017.